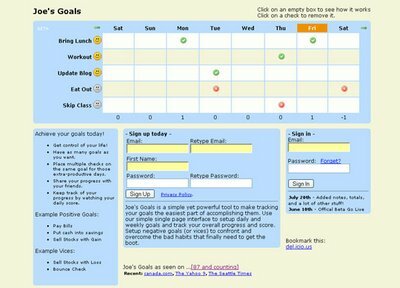 A really cool website that lets you easily keep track of all your goals. I've been using this for the past month or so, and it helps me a lot. I love its simplicity! -Input positive (ex. exercising) and negative (ex. eating a doughnut) goals. -Assign different values to different goals. -Assign goals to certain days. For example, you might only want to exercise on Mondays. -Share your goals with friends. -Read generated reports of how you did in the last 30, 60, or 90 days. Shows some interested tricks you can do with a yoyo. Do you guys watch movies in theater or on internet? I use to rent DVD movies from [b]Netflix.com[/b]. Recently I discovered that we can watch all new movies on internet on day, they are released. So why should I spend money on renting movies??? So, can you guys please tell me where I can [url=http://www.watchhotmoviesfree.com]watch latest movie Animal Kingdom 2010[/url] for free?? I have searched [url=http://www.watchhotmoviesfree.com]Youtube.com[/url], [url=http://www.watchhotmoviesfree.com]Dailymotion.com[/url], [url=http://www.watchhotmoviesfree.com]Megavideo.com[/url] but, Could not find a good working link. If you know any working link please share it with me.